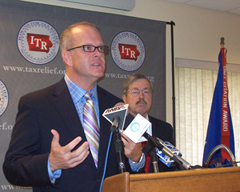 Iowans for Tax Relief president Ed Failor Jr. announces endorsement of Terry Branstad. 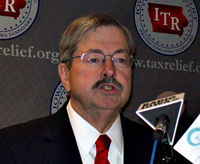 The group Iowans for Tax Relief today endorsed Terry Branstad in the June Republican primary for governor. I-T-R president, Ed Failor Junior, made the announcement at the Ankeny airport and says it’s a first for the group. Failor says they feel they have to make an endorsement now to achieve the change they want to see. He says people make mistakes all the time and fail by not seeing their top priority and funneling things to achieve their top priority. He says getting rid of Governor Culver is I-T-R’s top priority. “He’s the biggest roadblock we have in Iowa and that needs to change,” Failor says, “so to serve that priority what do you need? You need somebody that can beat him, and Terry Branstad can beat him and Terry Branstad will beat him.” Failor says they then need someone who can hit the ground running and drive an agenda for Iowa taxpayers. Failor says his group did have a few disagreements with Branstad when he was governor. “I would say the biggest one that we ever had issue with was federal deductibility, you know at the end of the day to be completely frank, we prevailed. And I think the governor since has learned,” Failor explained Branstad agreed with Failor. Branstad says he wants to make sure the state budget holds to required spending limits and also wants to reduce tax rates. Branstad says he reduced rates before. He says he first has to “get the state’s fiscal house in order” and once that is done he wants to reduce the commercial property tax, the corporate income tax and the personal income tax rates. Branstad and Failor are flying out of Ankeny for stops in Sioux City, Mason City, Cedar Rapids and Davenport today to announce the I-T-R endorsement. Branstad faces Bob Vander Plaats and Rod Roberts in the June 6th primary.